The host of the Winter Olympics has an abundance of places which offer entertainment for all members of the family. 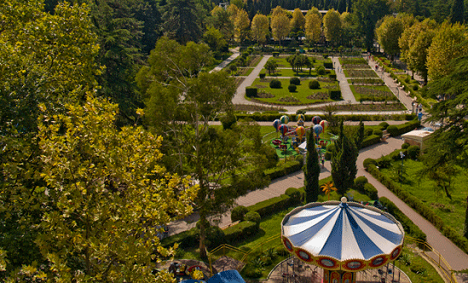 The park was founded by a well-known 19th century merchant and honorary citizen of Moscow; Vasily Khludov. He is rightly considered to be one of the pioneers of the Black Sea coast resorts. Nowhere else can the kids have as much fun in Sochi as at the Riviera Park. There are numerous attractions, sports area, go-cart track, Variety Theater, various sculptures and a promenade surrounded by trees. A dolphinarium, a pingvinarium and aquariums have started working at the Riviera recently. Dolphins and Humboldt Penguins, a bay seal and funny fur seals give performances that will interest viewers of all ages. The aquarium offers a unique exposition that has no analogues in Russia, and which can compete with the best aquariums in the world. There are seven aquariums with marine fish, two aquariums with freshwater fish and one aquarium with a mini-reef. Sochi, 1 Egorova St., Riviera City Park. Admission to the park is free. Ticket prices for attractions should be verified on location. Monday is a day-off for dolphins, penguins and fur seals. The history of the park dates back to the late 19th century. It has an area of 12 hectares, with many amazing arbors, fountains, sculptures, and various buildings. In addition, everywhere you can see unique flowers and trees, amazing birds and animals. Walking along the alley of the park, you can easily meet a beautiful peacock or a porcupine. Swans, ducks and pelicans peacefully get along in the pond. Russia's largest oceanarium is located in Adler, in Kurortny Gorodok (Resort Town). It occupies an area of 6,000 square meters, where 30 aquariums are located. The total volume of water in them is 5 million liters. About 4,000 fish of more than 200 marine and freshwater species live there. The most fascinating place in the aquarium is a 44-meter long transparent underwater tunnel. While here, you will feel like a resident of the ocean, surrounded by sea animals and reefs. Here you will also find the largest viewing window in Russia – 24 square meters. Another popular excursion site in Adler. This is a major research center of the Russian Institute of Medical Primatology. More than 4,000 monkeys of the most exotic species are kept in indoor cages in an area of 100 hectares, including baboons, macaques, marmosets, and chimpanzees. Many of the animals participate in scientific experiments and developments, particularly, in the field of space. For example, chimpanzees Tisha and Dasha, which flew into outer space in 1998, live in this apery. Animals undergo spaceflight training in Adler: they train their vestibular system, and get used to the seats of a spaceship. The monkeys come back here after their flights. The apery staff will gladly tell you all the secrets of the inhabitants during a tour that will be equally interesting for little kids, teenagers and their parents. No family holiday is complete without a visit to the Russian circus. Sochi is a city with good circus traditions. The festive and fairy atmosphere welcomes its guests right from the gate – the spacious lobby of the building is decorated with sculptures and bas-reliefs, as well as mosaic panels. Stars of Russian and foreign circuses perform on the local stage. The famous Russian circus families of Zapashny, Filatov, and Bagdasarov come here with their unusual programs. Sochi, 8 Deputatskaya St. For ticket prices, please call the box-office: +7 (862) 262-3366.